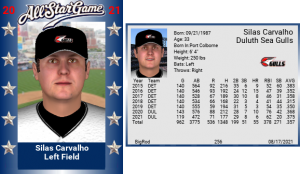 Detroit Rookie SP No Hits the Gulls – and LOSES! In his major league debut, Detroit starter Dan Pollard tosses eight no-hit innings. His reward? His first major league loss. Without getting a hit, the Duluth Gulls manufacture two runs. 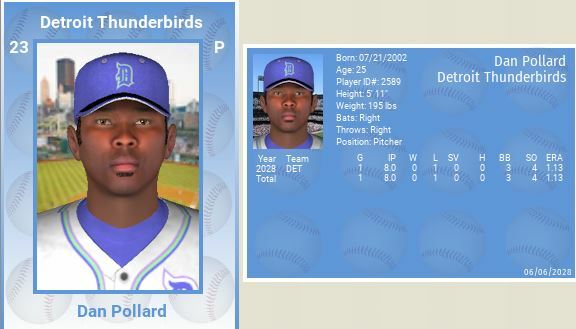 Meanwhile, Duluth’s pitching shuts out the Detroit Thunderbirds. Duluth beats Detroit, 2-0. Detroit recently traded starter Ronnie Taylor to Milwaukee, opening up a spot in their rotation. 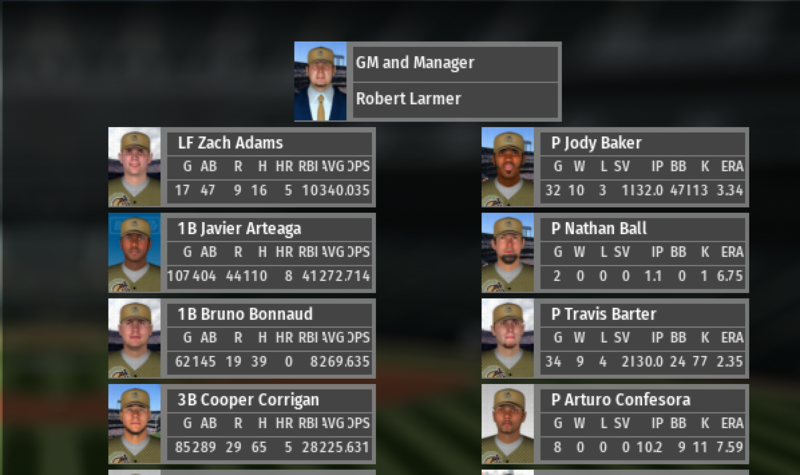 Pollard, age 25, was brought up to take his spot and eat innings. Facing the defending champions, Pollard strikes out the first two hitters he faces and retires 11 of the first 12. The one batter to reach base, Bob Pichon, walks and is promptly picked off. The Gulls score their first run in the fifth. Pollard walks Pichon for the second time, then hits Barry Brown with a pitch. A ground out advances Pichon to third. Juan Ibarra hits a deep fly ball, and Pichon tags up and scores without a throw. Pollard then retires the next 10 batters. 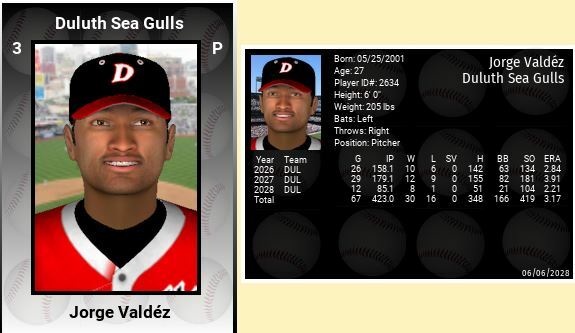 Unfortunately for Pollard, Duluth ace Jorge Valdéz pitches one of the best games of his career. Valdéz (8-1) walks none and allows just two hits over 8 1/3 innings of work. He strikes out a career-high 13 batters. His previous career high of 12 came nearly a year ago, on July 16, 2027, against the Toledo Neptunes. Two T-Birds reach base via errors by Duluth second baseman—and two-time Flashing Leather Award winner—Harvey Ormon. Both Detroit hits are are singles off the bat of Andy Blatchford—the only player on either team to get a hit today. The seventh inning, when Justin Henry reaches base on an error and Blatchford singles, is the only time where a T-Bird reaches second base. With the score 1-0, Pollard comes out to pitch the ninth. He walks the leadoff hitter—the opposing pitcher Valdéz. With the game still winnable and Pollard having thrown 114 pitches, the Detroit manager makes the tough call and pulls him from the game, despite the no-hit bid. John Cline comes in to relieve. A sacrifice bunt moves Valdéz to second. A ground out moves him to third. The would-be third out—a ground ball to second baseman Andy Blatchford—is bobbled, allowing Valdéz to score the second run of the game. Coincidentally, it’s Ormon, the man with two errors on the night, who hits the ground ball that Blatchford bobbles. Cline gets the next batter, Pichon, to fly out, completing the combined no-hitter. Valdéz comes out to pitch the bottom of the ninth, retires the first batter, then gets pulled for Christian Cassell, who records his second save of the year. After the final out, the crowd in Thunderbirds Ballpark was silent and seemed stunned. The loss stung, but they knew that they had seen something very special. Some fans made for the exit. On the field, Pollard shook hands then made his way for the tunnel and the clubhouse. Some fans stuck around and started chanting Pollard’s name. The chants grew louder and louder. Exiting fans stopped, turned around, and joined in. Word reached Pollard after a minute or two of chanting, and he came back out and tipped his hat to the remaining crowd, who cheered loudly. For the first time in 7 seasons the Championship Banner is waving from a USA franchise. The Sea Gulls of Duluth defeated the Owen Sound Waveriders in a 6 game series. Duluth advanced after a victorious 6 game series against the Milwaukee Eages. 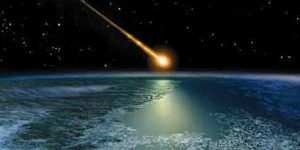 The Kingston Comets were the perennial second division team from 2015 to 2022. They managed but a single winning record, their second year in the league. 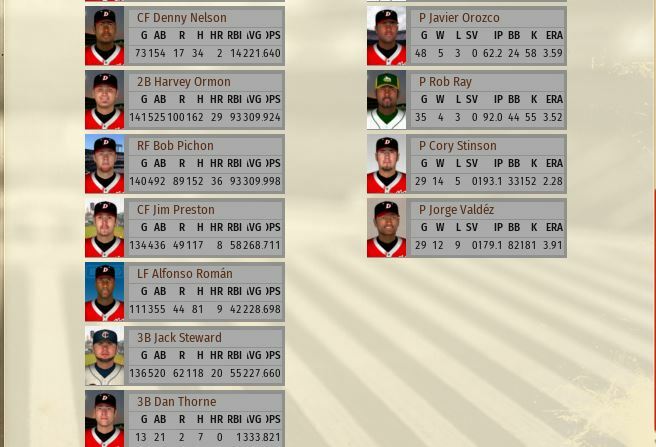 But, in 2023, they took the league by surprise streaking to an 85-69 season on their way to GLBL Championship #1. Since that glorious 23 season, they have won 80+ games every year. 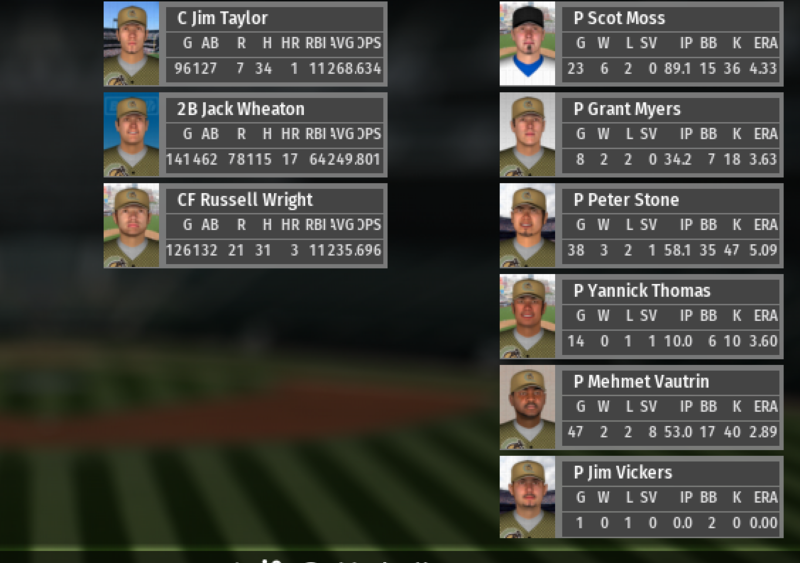 In 2026, they finished with 86 wins, their highest total to date. A seemingly bottomless pit of arms was too much for the USA Champs, as Kingston cruised to the title in six games. 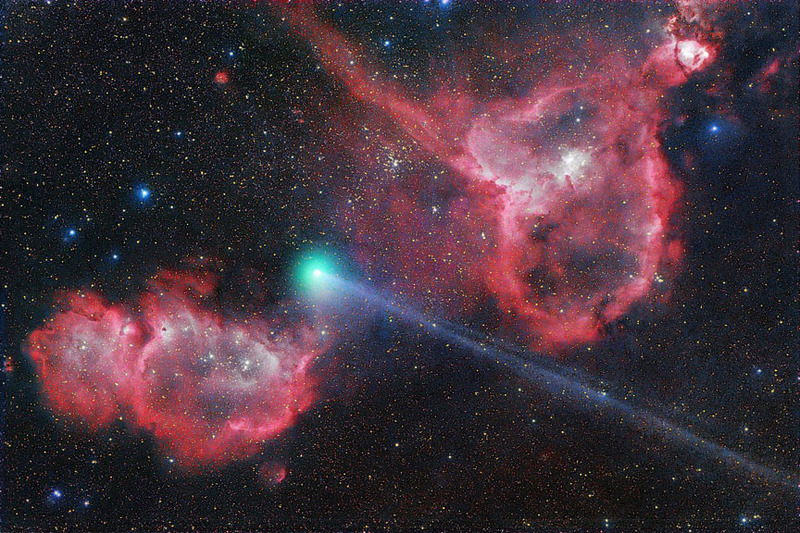 What defines the Comets? Pitching. Here are the cast that made Championship #2 possible. 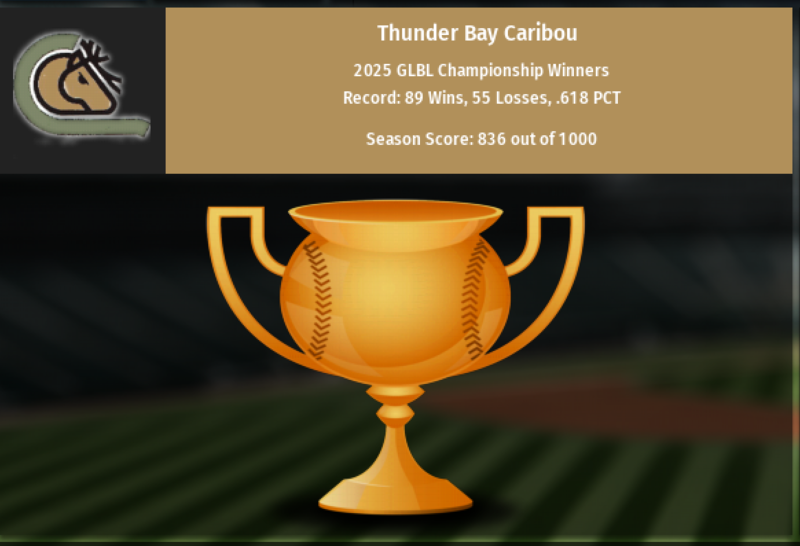 The Thunder Bay Caribou won their division in 2025, again. They advanced to the Finals, again. They played the powerful Detroit Thunderbirds, again. Finally, they won the series, four games to two…..again. For Rob Larmer, it was his second time to the podium to collect his GLBL ring. But, it was the third time the Caribou won the Championship, now more than any other franchise in the 11 year history of the league. No one saw it coming. Nine seasons in the league, and exactly ONE winning record, and that was eight years ago. 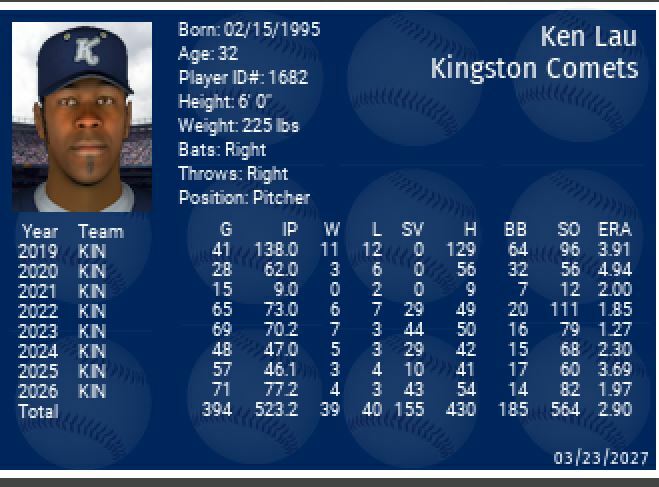 The beleaguered baseball team from Kingston Ontario, with the 516-616 record was a team off everyone’s radar. With not a single playoff appearance in the history of the franchise, Kurt Peterson, a.k.a. KP, was seven years into trying to solve the puzzle. Coming off a year where the team batting average was a paltry .235, where was the offense going to come from? Journeyman Jim (Copeland), a Comet career leader in RBI’s with 510, smashed 34 dingers in 2021, but tailed off to just 22 in 2022. He ended up hitting .221 (his highest batting average in the last 3 years), but he also stroked 46 home runs and batted in 102 runs. S Second year SS, Jordan Cannell, upped his game ripping 27 big flies while matching Copeland’s 102 runs batted in total. Just 11 miscues all year long and an impressive +5.9 ZR, Jordan was the pitchers ‘best friend’. Five time All Star, and the spark plug of the team, Nabhan ‘Wacky’ Ubadah hit .329 for the season and .340 in the post-season, before becoming injured in the clinching 6th game of the Championship Series. Nabhan is one of those rare players who walks more than strikes out, 63/60. 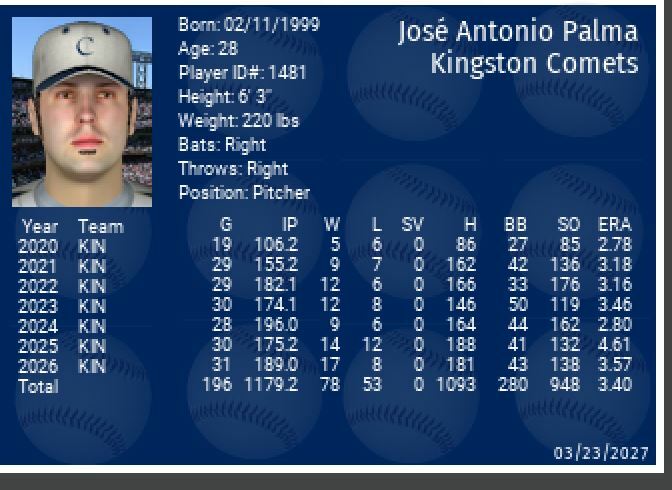 He was the Canadian League Championship MVP and a Silver Slugger award winner. Credit the gutsy move at deadline time by KP, who did not flinch when handing over the goods to acquire Adrian Eacott from the Maples. He was 3-2 during the last month of the season for the Comets, but more importantly 3-2/ 1.61 ERA in the post-season. In another starring role, it was Ross Singleton who really saved his best for last. 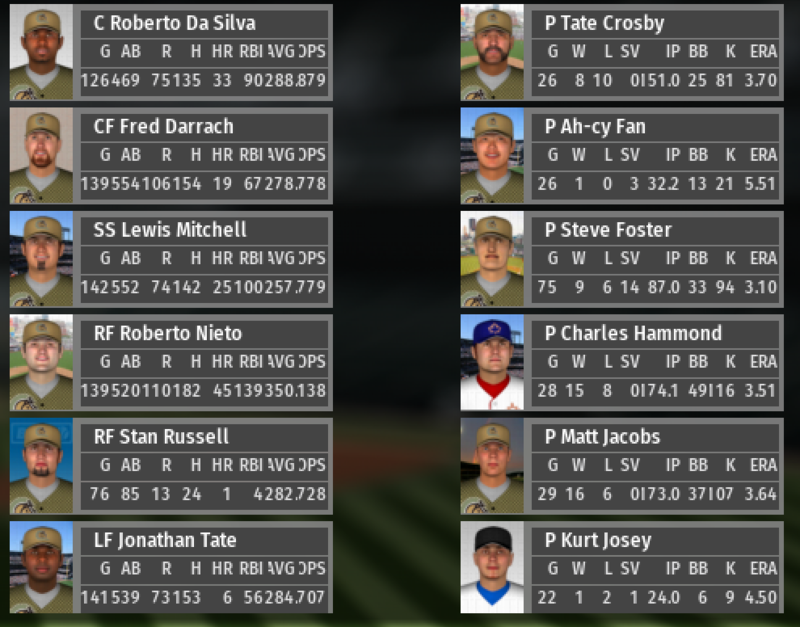 The 34 year old pitcher, in his first post-season, put together a masterful 2-0/ 1.21 ERA, line, leading the team at crunch time. 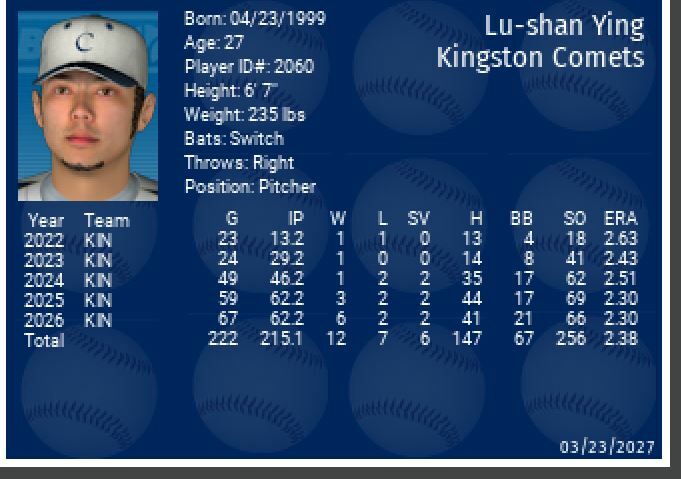 It’s worth mentioning Closer, Ken Lau, was tattooed in the post-season (1-2/ 2 BS) but it was this guy who saved 44 games during the regular season while posting a 1.27 ERA. 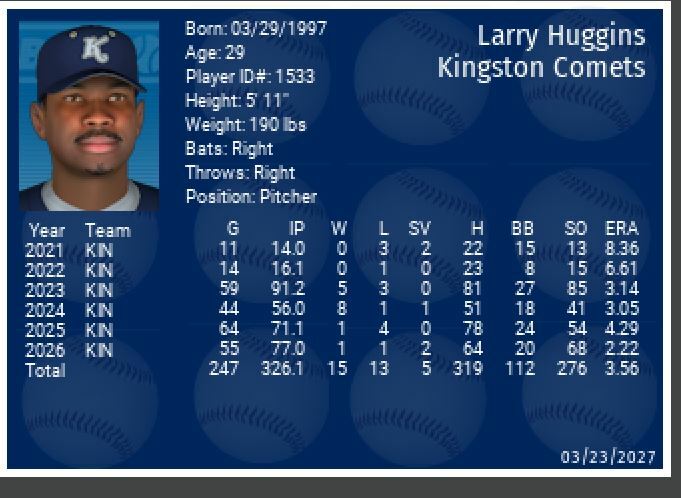 Toss in 7 wins and he played a part in 51 of the 85 Kingston wins. And, while erratic, he still saved 5 games in the playoffs. Congratulations to the 2023 Great Lakes Baseball League Champion Kingston Comets! Man, what a year. The Owen Sound Waveriders have won their first GLBL Championship as they defeated the Toledo Neptunes in a very spirited and competitive six game set. 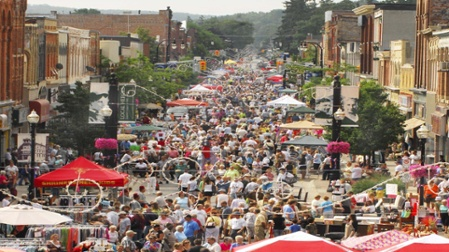 The 85 wins in the regular season were a franchise high for Owen Sound. One of the stars now, and looking into the future, is Wilbert ‘Sleepy’ LeGrow. He plays all the outfield positions and first base and mashed his way to an impressive .844 OPS over the course of the season. The recipient of the Silver Slugger Award is now a two time all star, at the young age of 25. On the mound the trio of Bonnefoy, O’Brien, and Wilson amassed a total of 38 wins. Randy Costello notched 41 saves his lowest total in the last three years. Up and coming 23 year old Nathan Yeo went 2-4 but gave us a glimpse of his upside with 0.98 WHIP. Really, no weaknesses on this club as they were first in runs, second in runs against, and second in Team D in the Canadian League. 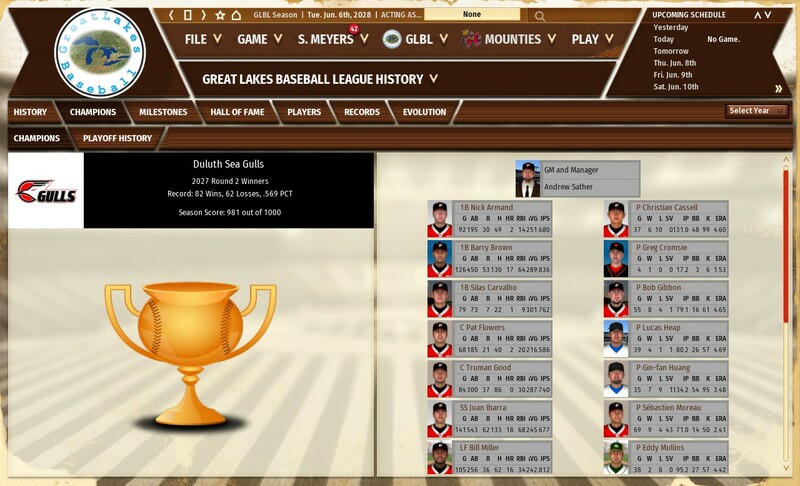 It took just 6 games to win their first Great Lakes Baseball League Championship but then, again, it took 7 years to finally achieve that goal. Perpetually knocking on the door only to come up just short the Mounties finally negotiated the last hurdle by leaping over the Chicago Architects with their 5-4 win at Lakeside Park. 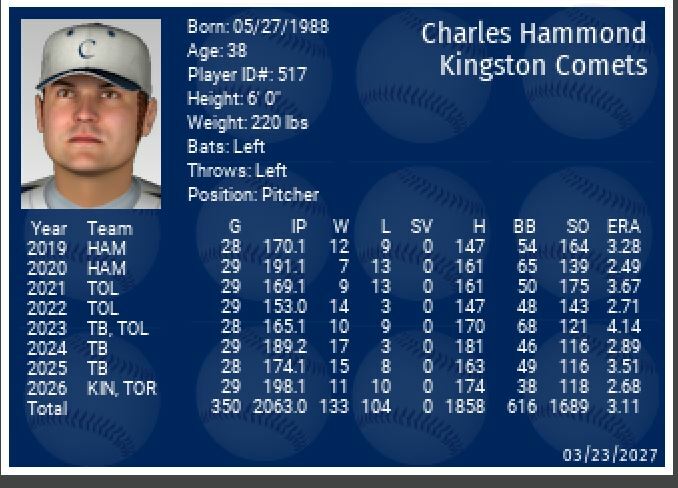 The Architects and Mounties had identical 82-62 records but Hamilton owned Chicago in the brief regular season by winning all four games by scores of 2-0, 10-4, 6-4, and 3-2. And, on this first day of October, catcher Joe Kelley made sure the Mounties would take home the grand prize as his solo shot in the 3rd inning was the difference. So, the life time record of 536-452 (second only to Chicago) now has a championship banner to secure the reputation as one of the top teams in the history of the league. 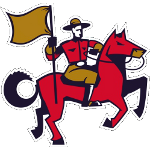 For the Canadian League it was sweet stuff indeed to see the string of USA titles arrested at five in a row as Hamilton joins Thunder Bay as the only Canadian teams to win a championship. Geoff Boyd won the Most Valuable Player award as his relentless hitting down the stretch of the playoffs propelled Hamilton to the title. For Chicago it was another great season that saw them win the USA championship and then compete in their fourth League Championship having won two titles to date. 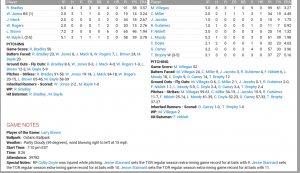 Toronto tied the game, 4-4, in the bottom of the 7th. With runners on second and third, Jesse Stannard singled to left. The runner on third scored, tying the game, while the runner on second tried for home … but was thrown out. After that, there were some singles and walks, but a runner didn’t reach scoring position until the 10th (when Toronto’s Michael Howard got stranded at third) and then the 18th (when Windsor’s Harry O’Connell hit a lead-off doubled but was stranded at third). Runners reached second in the 20th (single and sac bunt) and 21st innings (walk and ground out that advanced the runner). In the top of the 26th, Windsor’s Christophe Sarrazin doubled with two outs and got stranded. In the bottom of that inning, Michael Howard led off with a triple and was driven in by Jesse Stannard to win the game. Of Windsor’s 287 pitches, 180 came after the game got tied, 4-4, in the seventh. Of Toronto’s 371 pitches, 238 came after the game was tied. Think of it this way: if the game had started in the 8th inning, it would have gone 19 innings, Toronto would have won 1-0, and the teams would have combined for 418 pitches. Windsor’s Larry Brown came on to pitch in the 13th inning. He pitched 7.2 shutout innings in relief, striking out 6 and walking none. 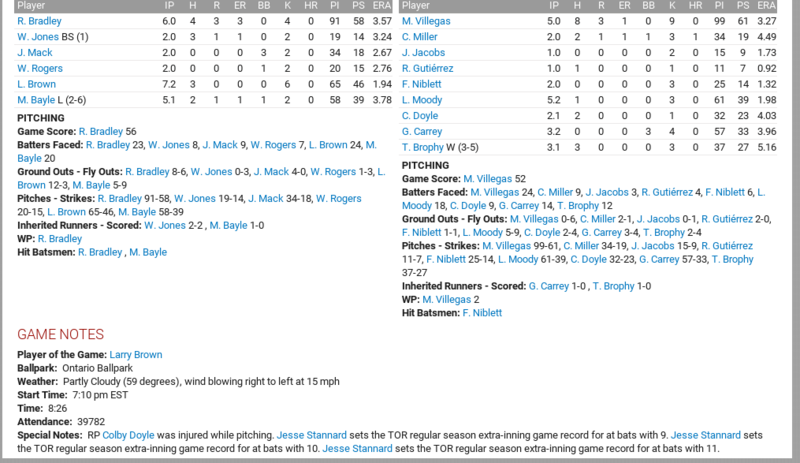 Toronto pitchers struck out 29 Vigilantes. Jesse Stannard was the last batter, singling in the winning run. He led off the bottom of the first, doubled, and scored the games first run. On the day he went 3-for-11, with a run and two RBIs. Jesse Stannard, the hero, sending what few fans remaining home for an abbreviated sleep. Godzilla Garcia is not only threatening to hit .400 but he is actually raising his average as this past week saw his batting line go from .420 to .423. In last evenings contest he went 3 for 4 against the Neptune’s with a double. Toledo managed to win 6-1 as their challenger for the batting title, Carl MacNiven went 2 for 4 with his own double to ease his average back up to .389, yet at the same time quieting conversation about whether he might hit .400. 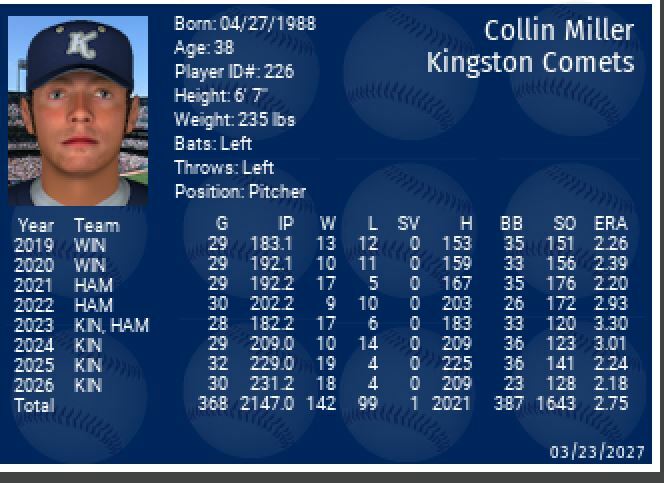 Sourface MacNiven is hitting .107 points above his average for last season and still has a shot at .400. If this were a horse race you might hear the announcer using the classic vernacular of the sport something akin to ‘they are around the far turn’ and you would know that these two batting giants are about to head to the stretch. But, if you were not paying attention you might miss some activity, say, ‘coming up from the rear’. Not to be out done, the face of the GLBL is making his own bid for another batting crown as the two time Lake Superior Award winner and two time Lake Erie Award winner, and seven time all star (aka every year) is preparing for the stretch run with a vengeance. Shotgun Time! He was hitting .256 near the end of April but he’s been classic Silas since then and is now batting .375. So the question is as we head to the stretch, ‘who can go the distance’? When you are 23 years old and playing at the GLBL level you are usually riding the bench hoping for an opportunity for a spot start here and there always with the hope that you impress the manager enough to give you another opportunity, hopefully in the form of a start. Less likely, but still possible, you might be the benefactor of a long term injury to a player that moves you up the depth chart (Google Wally Pipp). In the case of Guillermo ‘Godzilla’ Garcia he has already eclipsed the status described above as he is now the starting RF while spending some time in CF. He’s 4.8 ZR combined. But, we are not here to talk about his glove, or his arm (7 assists). It’s the bat that carries his .416 batting average. 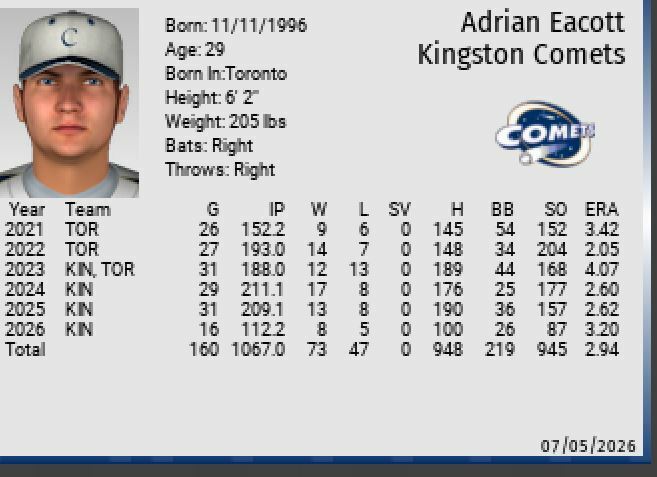 89 hits in 214 at bats qualifies him as a legitimate challenger to ‘Sourface’ McNiven of Toledo for the leagues highest batting average in 2021. And, you don’t want to face this guy in a matinee contest as he hits .445 during the day hours. In 316 AB’s he hit .341 in 2020. In the current season he has posted 0 HR’s and 1 triple and appears to be the classic slap and hit batter who uses his speed to beat out infield hits. No question, Godzilla is a legit candidate to lead the league in batting for quite some time. Al on Chicago in 2018? Kurt on Chicago in 2018?